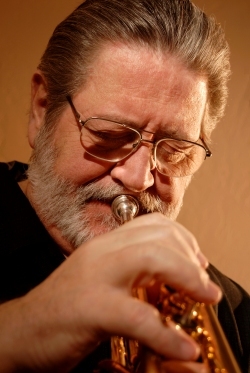 Born In Albuquerque, New Mexico, Bobby Shew began playing the guitar at the age of eight and switched to the trumpet at ten. By the time he was thirteen he was playing at local dances with a number of bands and by fifteen had put together his own group to play at dances, occasional concerts and in jazz coffee houses. He spent most of his high school days playing as many as six nights a week in a dinner club, giving him an early start to his professional career. He then spent three years as the jazz trumpet soloist in the famed NORAD multi-service band. Shortly after leaving he joined the Tommy Dorsey Orchestra under the direction of Sam Donahue, which, among other things, gave him the chance to perform quite a bit with trumpet legend Charlie Shavers. After his stint with Tommy Dorsey, Bobby was asked to play with Woody Herman's band upon Bill Chase's recommendation. He then spent some time playing for Della Reese and Buddy Rich, who's big band had just been formed. Many other similar situations followed and Bobby played lead trumpet for a number of pop stars. This brought Bobby to live in Las Vegas where he became prominent in various hotels and casinos. By this time Bobby was widely known for his strong lead playing rather than as a jazz soloist. So late in 1972, he decided to make a move to the Los Angeles area in order to get reinvolved in developing as a jazz player. Once in Los Angeles, Bobby quickly found what he was looking for, and in the years to come he spent time with the groups of Art Pepper, Bud Shank, Horace Silver Quintet, and Frank Strazzeri-Sam Most, as well as numerous big bands such as Bill Holman, Louie Bellson, Toshiko Akiyoshi-Lew Tabackin, Oliver Nelson, Bill Berry, Nat Pierce-Frank Capp Juggernaut, Ed Shaughnessy, Terry Gibbs, Benny Goodman, Maynard Ferguson, Neal Hefti, Don Menza, and Bob Florence. In addition to being a sideman, Bobby also became a leader around this time, recording many of his own albums. Several of these received very high accolades from critics and high placement on the airplay charts. One of his albums, 'Outstanding In His Field' was nominated for a Grammy in 1980, while, 'Heavy Company' was awarded the Jazz Album Of The Year in 1983 by the Recording Industry Association of New Zealand (RIANZ). During this time Bobby also found a great deal of studio work, including TV shows like 'Hawaii 5-O', 'Streets Of San Francisco', 'Bob Newhart', 'Mary Tyler Moore', 'Midnight Specials', 'Don Kirschner Rock Concert', 'Happy Days', 'Laverne And Shirley', and 'Eight Is Enough.' His work on soundtracks includes 'Grease I and II', 'Rocky I and II', 'Six-Pack', 'The Muppet Movie', 'The Drivers', and 'Taxi'. Today, in addition to a busy performing and private teaching schedule, Bobby spends a considerable amount of time actively involved in the educational system, conducting clinics and master classes at high schools and college campuses all over the world. Bobby has also been active on the Board of Directors of the International Trumpet Guild and has acted as National Trumpet Chairman for the International Association of Jazz Educators for 16 years. He authors numerous articles of educational interest in various trade magazines, all translated into several languages for worldwide distribution. During a period of traveling to New Zealand, Bobby acted as host for a weekly TV show entitled 'Just Jazz' and has been in numerous artist-in-residence situations virtually all over the world. He has even had a few minor acting roles in movies and TV shows. He continues to tour internationally and to produce and record excellent music. He has released several recent albums for the MAMA Foundation including Playing With Fire (w/Tom Harrell), Heavyweights(w/Carl Fontana), and Salsa Caliente. In addition, for other labels, Bobby has released the highly regarded CD recorded with The Metropole Orchestra, and a double-CD set for Seabreeze Records of The Music of John Harmon, plus other which can be seen on the Discography page. Bobby has endorsed Yamaha equipment for years and the fact that they have recently been using him for advertisements is a further indication of his popularity. Bobby Shew never stops using his remarkable insight, sensitivity, and creativity to inspire the next generation of jazz players and teachers.